The Eagles win in Super Bowl LII created a feeling of excitement throughout the city of Philadelphia. Now, imagine if your brand could do the same! As a lifelong Philadelphia sports fan, loyalty to my teams has been accompanied by the strain of being an underdog. I’ve also witnessed firsthand how a community can come together when a team succeeds. Between the Eagles, 76ers and Villanova Wildcats, Philly sports fans have had many opportunities this year to celebrate together and become one team. It’s this shift in focus that offers a unique opportunity for a brand to align with something big, exciting and positive. People primarily think of advertising as those paid social media posts that appear in the middle of their feeds. Digital advertising offers brands impactful and targeted marketing strategies by reaching a specific consumer base, at an exact time, in an exact location. Brands can optimize digital marketing through programmatic buying and search engine optimization as long-term marketing strategies used to grow audiences and meet business objectives. That said, brands often setup their ads and let their messaging go stale which, in return, causes it to lose authenticity. If a brand is struggling to develop a positive brand message, grow new audiences, or establish a position in the market, it could be that that their message has stagnated. That means it may be time to find new marketing avenues. A low-risk, high-return option is to capitalize on the excitement that sports bring to a community. When Villanova’s Men’s Basketball team won the NCAA tournament this Spring, everyone in Philly (well, maybe not Temple and St. Joe’s fans) was proud to be a ‘Nova fan and represent the team. It’s times like these that successful brands can be flexible and creative to capitalize on this type of situation. Following the final buzzer of the championship game, there is a whirlwind of visibility for the winning team locally and nationally—TV appearances, parades, etc.—and only a short window of time for brands to develop messaging to piggyback off them. Marketing teams need to have creative concepts ready to be pushed live as soon as the opportunity arises. The ideas must be concise, relatable, and positive. When it comes to social media advertising, placing ads isn’t always enough. Engaging with consumers during an exciting sporting event will give the perception that your brand, like them, has been a fan all along. Think about how many people jump on the bandwagon when a team is doing well. Yes, we like to make fun of this group of people, but from a marketing perspective they serve as a new group of consumers to target. This new audience, often active on social media, will see that your brand is already supporting their team. Create a digitally interactive experience via social media that your audience can engage with and, most importantly, engage back! Consumers aren’t always necessarily looking to buy from brands that are trending; they want to purchase from brands that are responsive, engaging and trustworthy. 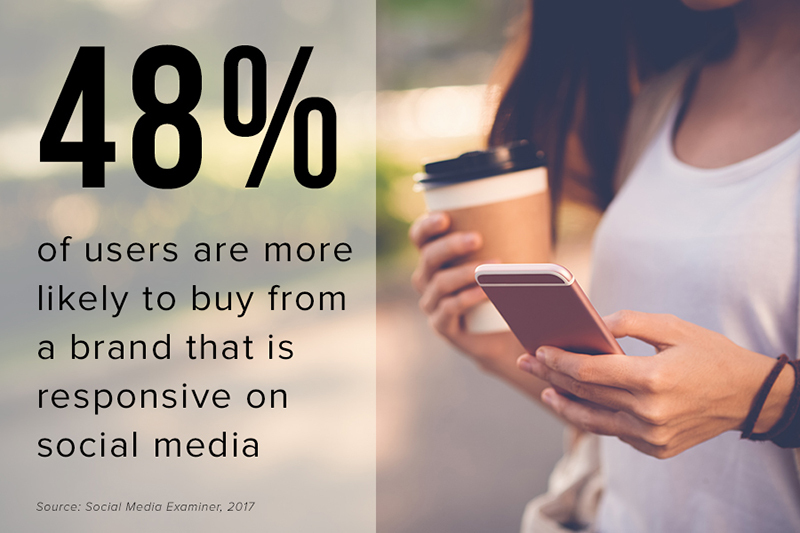 According to Social Media Examiner, 48% of internet users are more likely to buy from a brand that is responsive on social media (www.socialmediaexaminer.com/how-consumers-respond-to-brands-on-social-media-new-research). Some of the easiest ways to engage and start a conversation is by using team’s handles, relevant hashtags, geofilters, and other tools. Consider posting video content, too, as studies show that 83% of businesses say that video provides a good ROI (www.dreamgrow.com/8-reasons-why-your-business-should-use-video-marketing). When the Eagles won the Super Bowl, the entire population of Philadelphia was proud to be part of one community. Some brands recognized this moment of harmony and took advantage to build their image. They realized they could target and connect with their audience through experiential marketing to build positive brand interaction. A successful experiential campaign should serve as a simple and positive way to engage with your audience. Experiential helps amplify your message and bring your brand to life, while creating a memory for your audience. It gives your consumers something tangible and new with which to connect. Naturally, consumers are more likely to remember an event than a banner ad on Facebook. An exciting event will spark your audience’s interests and encourage them to share their experiences on social media. This will provide your brand with significantly more impressions and provide an opportunity for message amplification. Do something original, fun and unique— think big! “Trust the process.” Everyone in and around the Philadelphia area has heard this phrase by now. A twist on this phrase was recently used in Cleveland, Ohio, to recruit Lebron James to join the Sixers. Power Home Remodeling, used just 3 billboards to encourage James to “Complete the Process.” Their traditional OOH campaign gained visibility throughout the entire country. This is a prime example of a company latching onto something the whole city supports to enhance their image and relevance. 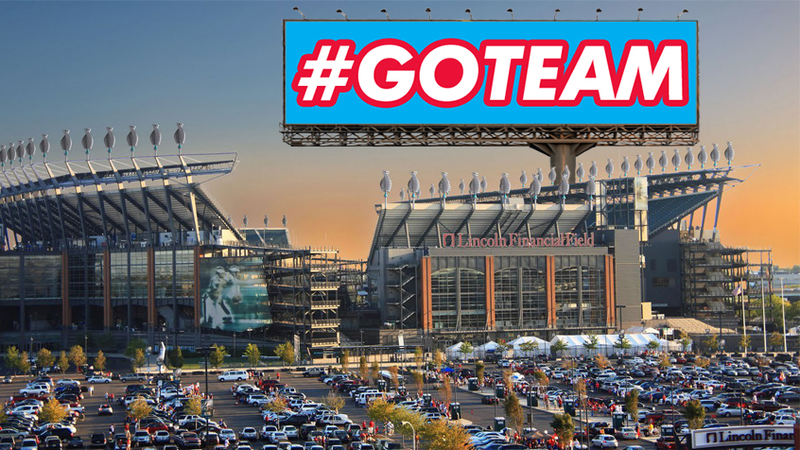 While we don’t expect a few billboards to persuade James to move to Philly, studies show “the average consumer needs to see something at least 10 times before they take a call to action,” according to ATA Outdoor. So maybe there’s a chance?! As another example, Haverford Trust temporarily changed their billboard creative to read “E-A-G-L-E-S!” after the Eagles told Tom Brady to get lost and took home the Lombardi trophy. That’s practically all you need: one word and now you’re part of the Philadelphia community while simultaneously creating a positive brand image. Unlike radio and television, a consumer can’t just change the channel when it comes to traditional OOH. If they pass a billboard on the highway, they are going to see the message. There’s no way to avoid it, unless of course they close their eyes (but let’s hope drivers aren’t doing that!). Interstate I-95 is used as a local commuter road in Philadelphia, with most drivers traveling 3 exits or less. In fact, “four of the seven busiest interchanges in the I-95 Corridor are in Philadelphia,” according to 95 Revive, with up to 160,000 vehicles traveling through this area in just ONE day (www.95revive.com). That’s a lot of impressions! Create multiple concepts. Have options for all possible outcomes. Simple and straight-forward. Don’t let your brand interfere with the bigger picture. Go digital! Easily pivot your message and upload artwork instantly. Sports teams are constantly developing and refining their strategy to position themselves to win—your brand marketing should be the same way. Don’t wait until the last minute to come up with a strategy and frantically piece together messaging that falls flat. Successful brands position themselves to take advantage of an opportunity by understanding consumers’ interests and by being creative and engaging. Sports offer infinite ways to reach your audience and by keeping your messaging around your teams your brand will stand out from the rest. If you need help walking through the X’s and O’s of a successful campaign strategy, send us a message! Haley is a graduate from Penn State working as a Project Coordinator in OOH. In her spare time, Haley enjoys frolicking the streets of Philadelphia with friends, traveling to Long Beach Island, and taking snapchats of her dogs. It’s safe to say she is living the dream.